Kenneth George Sanders was born July 8, 1941 in St. Louis, Missouri. The five foot eleven, right handed pitcher was signed by the Kansas City Athletics in 1960. In his first minor league season he won 19 games, then moved on to A ball where he went 13-8 with a 3.96 ERA. The following year he went through all levels of the minor leagues but lost 18 games. That season he was converted to a relief pitcher & found success. He made his MLB debut in August of 1964 appearing in 24 games going 0-2 for the Kansas City A’s. In 1965 he was drafted away by the Boston Red Sox in the Rule V draft, then in June was sent back to the A’s with former Met Jim Gosger for Rollie Sheldon, Jose Tartabull and John Wyatt. That year he went 6-10 between Boston & Kansas City. Sanders would spend most of the next four years in the minor leagues, making just seven appearances with the 1968 Oakland A's. In 1970 he was traded along with Phil Roof, to the Milwaukee Brewers in their inaugural season, as baseball returned to Milwaukee after a five year absence. He enjoyed his best years with the Brewers in their first three seasons and was became one of the A.L.’s top relievers. In 1970 he had a great season, finding himself at 4-0 with seven saves and a 1.75 ERA entering September. That month he made five more saves, won another & took two losses. Overall in 1970 he made fifty appearances, saving 13 games going 5-2 with a 1.75 ERA. In 1971 Sanders went on to lead the A.L in saves with 31. He also led the league in appearances (86) games finished (77) & fielding for a pitcher (.977 %). Overall Sanders was 7-12, with a solid 1.91 ERA, making him one of the toughest right handed relievers in the league. He returned to save 17 more games (5th in the AL) the next year, posting a 2-9 record with a 3.12 ERA. He finished 51 games which was second most in the league. Sanders soon became a journeyman pitcher, & would play for nine different teams in his ten year career. 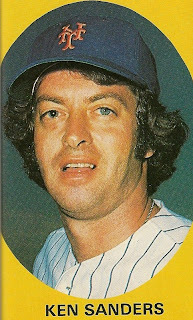 He moved on to the Minnesota Twins (1973) Cleveland Indians (1973-1974) & California Angels (1974) before joining the New York Mets in 1975. Sanders would save at least one game with every team he went to, and enjoyed a career best .833 winning % going 5-1 in Cleveland with the Indians in parts of the 1973 season. 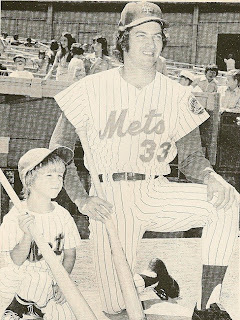 He came to the Mets in exchange for another great yearbook prospect, Ike Hampton during Spring Training 1975. 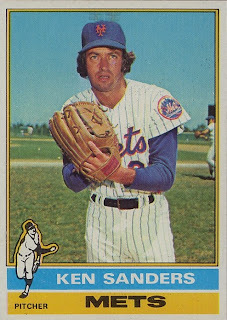 By then Sanders was a middle reliever in the days where there was no glory for that spot. Sanders began the year at AAA Tidewater where he was 6-1 with a 1.34 ERA saving nine games. He was brought up to the Mets by the end of June where he debuted at Shea Stadium pitching two innings against the Philadelphia Phillies. On July 8th in his fifth Mets appearance, he earned his first save as a Met, pitching a scoreless 9th in Atlanta. Later that month he earned two saves in a three game series at Wrigley Field in Chicago. In August he was forced to leave a game before throwing an official pitch, when he was hit above the eye by an wild throwback from catcher John Stearns. Sanders closed out the year saving two more games in the last week of the season. Overall in 43 appearances he was 1-1 with five saves posting a 2.30 ERA in 29 appearances. His five saves, which was third best on the Mets staff, behind Bob Apodaca & Rick Baldwin. Sanders was back on the Mets staff in 1976, he earned his first win on April 25th pitching three scoreless innings in Houston against the Astros. On May 21st he earned a save in Montreal then took a loss in St. Louis on the 22nd. ﻿﻿﻿In September of the bicentennial year his contract was sold off to the Kansas City Royals. Sanders finished his ten year career there at the end of the season. 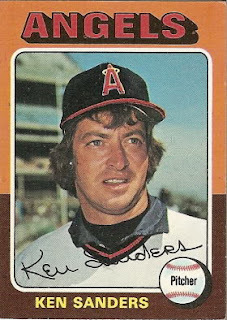 Retirement: Ken was very involved in the early days of the Players Union during the early to mid seventies After his playing days he has been on the MLB Players Alumni Board for over twenty years. Sanders also has sold real estate & worked as a real estate consultant in the Milwaukee area. In 2010 he oversaw the proposed deal of the field used in the movie “Field of Dreams”.